Strikes me the BMW 1 Series M Coupé is almost everything M3 drivers have been asking for years save for one major detail: it's not an M3. So will M3 guys quit complaining and take a 3200lbs 1M or will they find some reason not to like the 1M? Well, it's a bit like the Cayman vs the 911, isn't it? If you want to read all about the fine details, I suggest you hop over to Bimmerfile.com(or now on BMW.com) and since Axis Justin has the #1 spot for a 1 M at a local dealership, you can be sure we will do a proper Axis style track test as soon as we are able. Would have been perfect with a real M powerplant like the S54. It's too bad it's just a tuned standard BMW motor, not to mention it's a turbo. Well it has proper brakes, which its a big plus over a stripper E46. Will have to drive it to judge if the Turbo is an issue or not, but I've learnt how to appreciate the torquey nature of Turbos (but still prefer N/A). The big downer for me, is that it should have been a Hatchback. I blame the US market for the useless (and fugly) Coupe shape. It has no practicality. A Cayman has more storage space. The 3 pedal dance is nothing more than an outdated tradition. Its slower and less efficient than a proper sequential. The sooner the public realizes this, the sooner we can have proper technological advances offered in proper cars like this one. I, for one, am very disappointed to see that BMW chose not to include a DCT option on this car (if not make it standard!). I have to agree that I find the 1-series Coupe shape to be a touch fugly. It's sorta... unbalanced looking. The aggressive fenders and front-end help this one a bit. The 1er hatch has really grown on me though, and I'm quite positive it would sell at least as well as the coupe here... I.e. people who want both a 'small' and practical RWD car. Oh but BMW USA is run by evil marketing execs... Think of the brand image they cry out! A hatchback is an... economy car thing right? right?! What is it about driving a stick that is more enjoyable than DCT? Also, I think your stereotyping when you say that a manual car is designed for enthusiast enjoyment over numerical stats. I like to think I'm very much an enthusiast, and think that enjoyment in driving has little to do with a third pedal. Driving enjoyment for me has more to do with harmony between driver and his equipment. True enjoyment for me is when the car feels like an extension of my body and control feels hard wired to my brain. If the computer controlled clutch is setup properly, I never miss not having the pedal. Oh please, real men don't drive synchronized transmissions. I mean you don't even have to double clutch fer crissake! And don't det me started on electric starters and worse, radial tires which took all the fun out of driving what with their so called grip and durability! The third pedal is about doing it yourself and appreciating the work you've put in to become a good driver. I for one would absolutely choose a DCT option for all out racing, but one issue is that most electronic systems fall short either on the road or on the track. Driving for a lot of people (yourself included) is about being connected to the car, but it seems it would become a little too sedate if downshifts and upshifts were all perfect all the time. Sure you can say there's more time to focus on your braking zones, but that's it. Where's the room for improvement and satisfaction?? Not to mention powershifting and the occasional chirp on a downshift. My point is that enthusiasm comes from the somewhat frantic nature of driving quickly and you want to simplify it. I get the concept and I'm for it on an Ariel atom 500 but not a 330hp M car. Wow, I seem to have started a firestorm, which I didn't intend. No disrespect for DCT, but I enjoy a stick-shift. Oh, AC... you jest. My preference has nothing to do with the "real men" junk, rather sheer simplicity (Oh, I hope no one takes that wrong, too). Anonymous, there is much more to driving at 10/10ths of your ability than just heel-toeing. You seem think that if upshifts and downshifts are perfect everytime, the only factor the driver can perfect is braking?!?!? What about entry speed? What about slip angle? What about line through the turn? What about throttle modulation? What about balance? If your driving 3/10ths, well sure, everything is simple and even my grandmother can do that, so there i see your satisfaction in a good heel-toe. But at 10/10ths, its a very different story. At 10/10ths a proper heel-toe downshift is only a tiny fraction of what it takes to feel a sense of accomplishment through a turn (or series of turns). Bottom line, to each his own. My point is not that only true enthusiasts do the dance. I'm all for new tech and a better driving experience. I don't think any of us would be on this website if we thought heel toe and braking zone's were all driving was about. I don't go 10/10th's on the road but if I did DCT would be my choice. I simply can't justify having tech like that on something without a real power-weight ratio like a porsche 914 with a wrx swap, a 400+whp evo, even a track cart. Those car's need a semiauto trans to go 10/10th's and survive. You can drive this car 10/10th's without needing DCT. Not to mention I'd gladly go without it to lower the price point. The Stick = Enthusiast thing is a USA only thing, b/c driving a stick is what differentiates the average american that only knows how to drive a slush box. In the rest of the world, mothers, grandmas, nuns, priests and tree-huggers included we all learnt and grew up driving stick-shifts, so there's NOTHING SPECIAL about. True enthusiasts should really want prefer what allows them to perform and control the car better. The Stick = Enthusiast thing is a USA only thing, b/c driving a stick is what differentiates the "enthusiast" from the average american driver that only knows how to drive a slush box. In most of the rest of the world, mothers, grandmas, nuns, priests and tree-huggers included we all learnt and grew up driving stick-shifts; so there's NOTHING SPECIAL about driving one. True enthusiasts should really want and prefer what allows them to perform and control the car better. I have driven the M3 DCT, and many others DSG/SMG/etc. They're fantastic beasts. If I was to be building a race car, I'd surely have a dual clutch (or even single computer controlled clutch) transmission. Opting for an H-box 6 speed would be absolutely silly for this purpose. CG I think the 1M is aimed squarely at the US market so that explains the 6 speed and the coupe. In the rest of the world it would cost 70 grand and make it a pretty hard sell. Personally, I think all new performance cars should be designed with a non clutch shifter in mind , including the Porsche-o-saurus' gt3, simply because that is clearly the better engineering solution. The Freep does not care which configuration you drive. Just drive it well, and stay the hell out of the passing lane when you're not passing. I'm talking to you, New Jersey. Amen to the words of the Freep. If your not passing stay right! "If you really want the mechanical dexterity test, there are plenty of beautiful old cars that need and deserve being preserved and restored :)"
Amen to that. It's almost romantic, I love it! What was the 135i concept that looked liked a ricer? That kinda looks better without the ricer parts. There's a few things I'd like BMW to offer. First, offer more color options. Valencia orange (w/ metal flakes!) is gaudy as hell, and the typical frost white and metallic black is boring(I should say that I want to DD this car so more color options would be nice) . Second, offer true sports seats like the ones from the M3 GTS. Third, some delete options like backseat delete to make it even more lighter and focused. Fourth, CF roof option would be nice and choose between painted or not. With that said I probably just go with the GTS seats and frost white. Is it a great car? Probably. Should it be compared to an e30 M3, Nope. 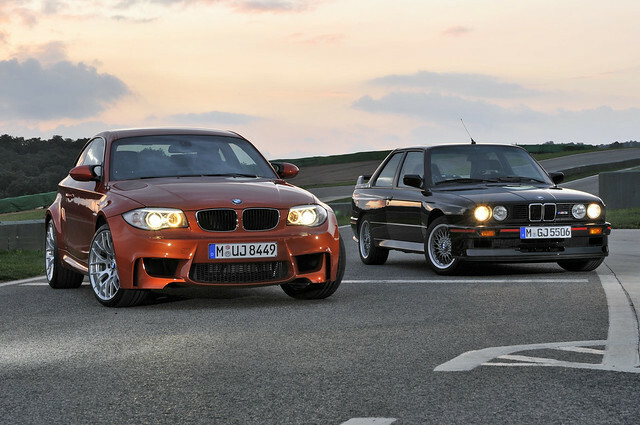 Lets see it win as many titles as the e30 M3 and then maybe the comparison might be valid. On the pointless DCT vs. Manual discussion. My 2 cents. Lets see what happens in 10 years when most DCT boxes will have failed due to aging electronics and wear and tear on all the complex parts required to perform 60ms shifts. Throw a few clutches and maybe an input/output bearing at a conventional manual gearbox and it'll go great for decades.